I work surrounded by books and magazines. 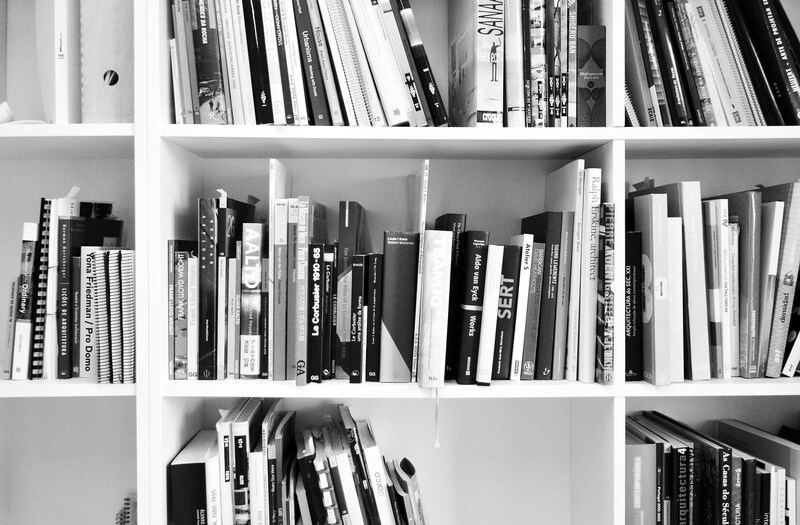 Some years ago they were essentially about architecture, due to the dozens of books I’d bought during the University period, but that now merge with books about art, creativity and innovation. The architecture ones are mostly editions from El Croquis, Detail, Gustavo Gili and others, that focus mainly on specific authors, like R.M. Schindler, Le Corbusier, Giuseppe Terragni, Tadao Ando, Pierre Chareau, Álvaro Siza, Sigurd Lewerentz, Alvar Aalto, Luis Barragán, João Vilanova Artigas, John Pawson, Jorn Utzon, and many others. Among these I also have some generic editions, that reunite the works of different authors or make an approach to specif themes like industrial architecture, building in concrete, modernism, minimalism, sustainable construction, the history of EDP power stations, constructive details, etc. Since 2009 that I became more and more interested in innovation and creativity. More than architecture, I started to discover that my passion was the ‘art of creating’. The challenge of each creative process. Conceiving small objects like CEPA, buildings like PINC Pavilion, OCB Ermida, or directing big events like TEDxOporto, could be equally challenging and satisfactory. Innovation and creativity were themes that allowed that my brain got influenced by other types of creative projects, besides art and architecture. By other powerful artists and creatives like Stefan Sagmeister, David Ogilvy, David Kelley, among many others, and by their creative processes. And to connect different types of influence in my ongoing projects. I was searching for: 1. how to have a better control over my creative process; 2. absorb knowledge from other areas; 3. positively influence my work with it; 4. develop my critical thinking. Each project has to contain ‘life‘. It can be the production of an event, the design of a building or of a product. Besides finding the goal of its development, it has to arouse powerful sensations to each person that will interact with it. And it has to deeply connect with the future users. People have to empathize with them. And for that to happen, I truly believe that the much broad knowledge we have, more qualities we can put on our works. More able we will be to synthezise and reduce the final result to the essence of the demand. Because we can only write with the words we know. After my post ennouncing my online inspiration, here is a list of books that I’ve read recently, others that I’m currently reading and, at last, some I hope to buy/ read in a near future. -» A Technique for Producing Ideas, by James Webb Young, where he documents a step-by-step technique for sparking creativity in advertising, or in any other field. Recommended reading for people that have some difficulty in structuring their creative process (method), and to everyone that is simply curious. -» Luis Barragán: His House, by RM + Fundación BBVA Bancomer + FATLB. A beautiful book with amazing images of the architects’ own residence and studio, in Mexico, concluded in 1948. 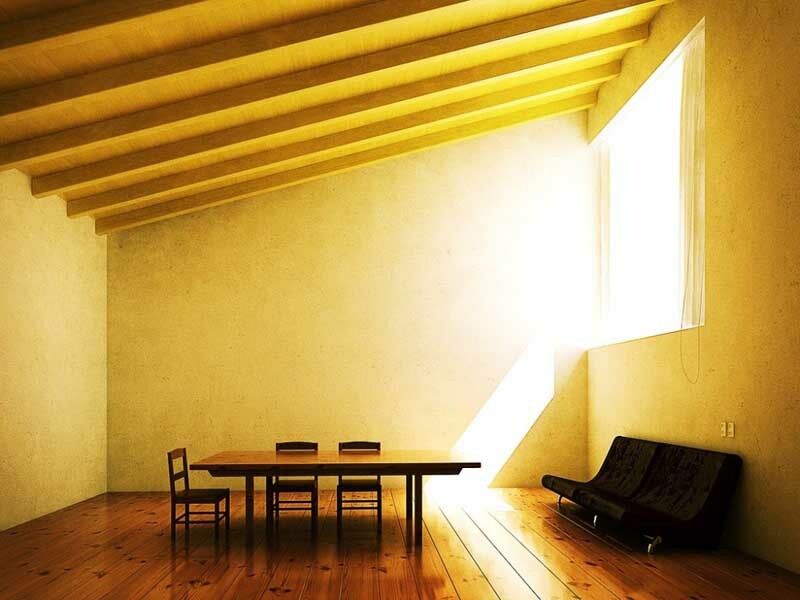 If I had to mention one creative personality that inspires through color, it would be Luis Barragán. -» Confessions of an Advertising Man, by David Ogilvy. -» The Future of Architecture in 100 Buildings, by Marc Kushner (TED Book). “With stunning photography and stories of architectural wonder from across the globe, The Future of Architecture in 100 Buildings illustrates the rapidly evolving world of architecture in the digital age.” in ted.com. A small and concise book, that reflects the authors vision for the future of architecture and trends, with appealing images. -» Design Thinking, edited by Thomas Lockwood. Dense, but very well structured book, that compiles essays from many of design’s biggest thinkers. It provides strategies to encourage the creative thought process in companies, which will ultimately help to cultivate innovation, and therefore boost business. -» Creative Confidence, by Tom and David Kelley. Tools to power creative confidence in yourself and in others and because it’s always good to read books from the best. -» The Architecture of Happiness, by Alain de Botton. 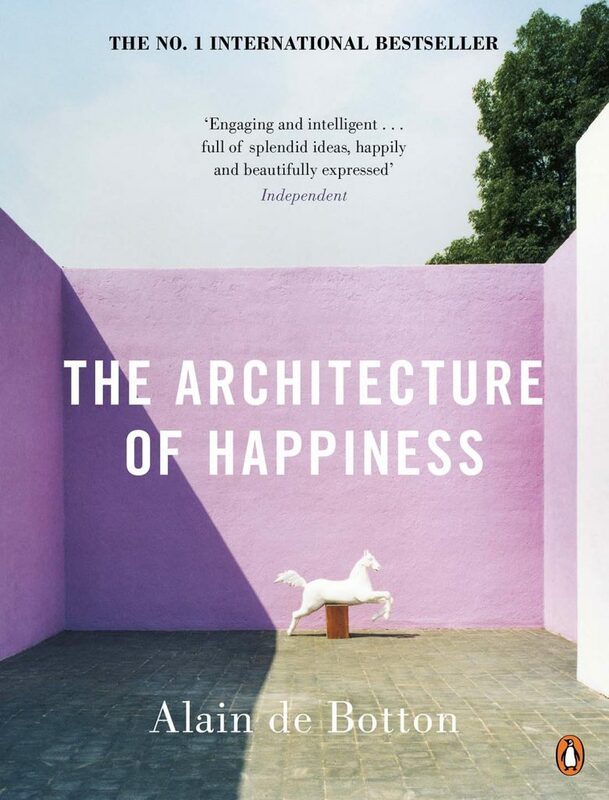 “The Architecture of Happiness starts from the idea that where we are heavily influences who we can be – and argues that it is architecture’s task to stand as an eloquent reminder of our full potential. Whereas many architects are wary of openly discussing the word beauty, the book has at its centre the large and naïve question: ‘What is a beautiful building?’ It amounts to a tour through the philosophy and psychology of architecture, which aims to change the way we think about our homes, streets and ourselves.” in alaindebotton.com. I’m simply loving it. Focusing more and more in understanding the creative process and creativity techniques, this list demonstrates this pursuit. -» The Art of Thought, by Graham Wallas. “(…) originally published in 1926, was the first work to give a clear, inspiring, and authoritative exposition of the process of reasoning, in language adapted to the general reader as well as the student of psychology. It established itself as a standard guide to the mechanism of thought (…)” in goodreads.com. The author was a social psychologist, educationalist, and co-founder of the London School of Economics. After reading A Technique for Producing Ideas, by James Webb Young, the opened my mind to the ways that we can control our creative process, I became very interested in exploring the four stages of the creative process that the author outlines — preparation, incubation, illumination, and verification. -» Tim Burton Interviews, by Bert Cardullo. Just want to dig deeper in the mind of one of the most talented creatives that lives among us. -» Teach Your Child How to Think, by Edward de Bono, a business and educational consultant. One of the books that I recently bought. 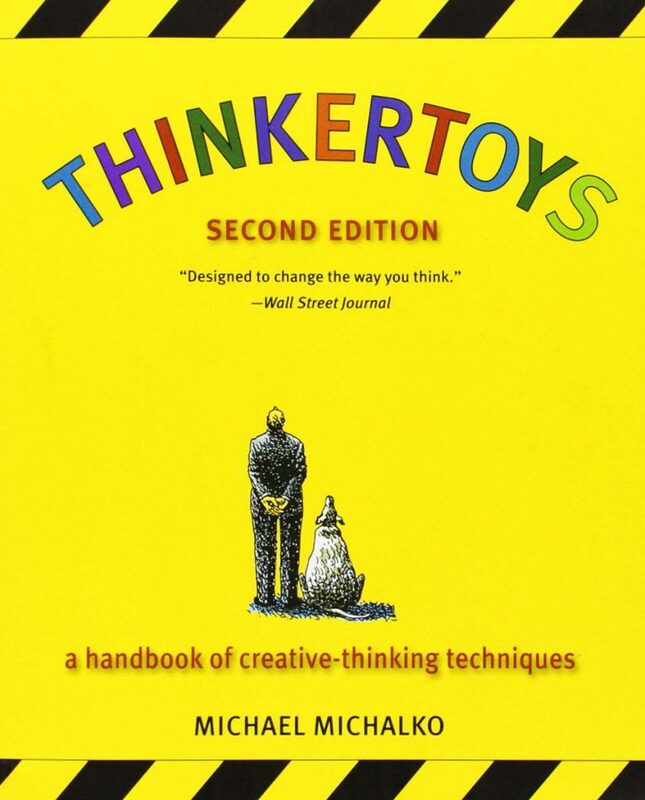 In this book, he lays out a step-by-step plan, with a variety of exercises, that will help children develop clear and constructive thinking, based on a method that makes thinking fun. He claims that while a child might be intelligent, it does not necessarily follow that that child will become a good thinker. The author asserts that this manual is “equally applicable to teach senior executives”. If you are a parent, aren’t you curious now? As a father of a 2 years old daughter, I’m counting the days to start reading it. “Many highly intelligent people often take up a view on a subject and then use their intelligence to defend that view. Since they can defend the view very well they never see any need to explore the subject or listen to alternative views. This is poor thinking and is part of the ‘intelligence trap.” Edward de Bono in ‘Teach Your Child How to Think’. -» Simplicity, by Edward the Bono. What’s your opinion about these suggestions? Do you have further recommendations? I would love to hear your opinion.